Boys adventure comics: Andersonic issue 23 is now out! Andersonic issue 23 is now out! Ayshea Brough interview - Ayshea talks about her time working on UFO. Archive - In 1993 Chris Drake interviewed Gerry Anderson for his book 'UFO & Space: 1999'. In the third part of this interview Gerry talked candidly about the making of Captain Scarlet. 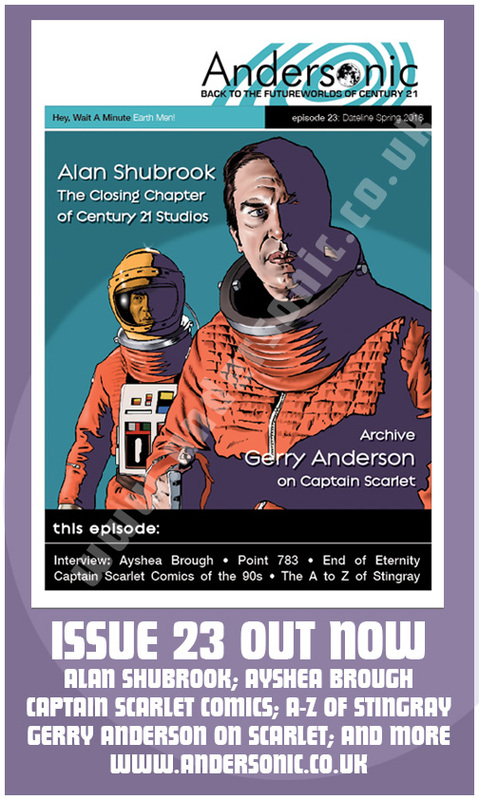 Alan Shubrook - Alan writes about the recent demolition of the Century 21 studios in Slough and also shares his thoughts on working on Captain Scarlet. Captain Scarlet Comics of the 90s - Graeme Bassett writes about his work on Alan Fennell's comic revival of the early 1990s . The A-Z of Stingray - Essential marine facts for the aquanaut of tomorrow - today! Space: 1999 - a critique of End of Eternity with the emphasis on Ray Austin's direction. Watching the Watchers - A look at Granada's Supermarionation transmission history of the 60s and 70s. Captain Scarlet - 'Point 783' - two writers slug it out over this popular episode. Merchandise Reviews - we review recent CDs and books. Plus 'Things You Do (when you're a fan)', news of an upcoming UFO convention and some other stuff. The issue comprises 44 pages with colour inner & outer covers. It's now available via the website www.andersonic.co.uk (and eBay for a short period in the Collectibles > SF > Thunderbirds section); if you'd prefer to pay by cheque, please get in touch for the new postal address. Back issues are also (mostly) in print. Cost (including UK postage) is an incredibly low £2.90. So what exactly is Andersonic? It's an A5 paper fanzine which covers the films and television series of Gerry and Sylvia Anderson. Each issue contains features and articles which explore and discuss their many series, from the black and white Supercar and Fireball XL5, 60s series Stingray, Thunderbirds, Captain Scarlet, Joe 90 and The Secret Service; the live-action series UFO and Space:1999 and later stuff such as Terrahawks and right up to date with New Captain Scarlet. In previous issues we have also covered the films Doppelganger and Into Infinity. We have featured interviews with, amongst others, Mike Trim, Dominic Lavery, Shaun Whittacker-Cook, Jan King, Robert Easton, Tony Harding and Mike Noble. Best signatures ever in an Eagle annual?